The forum part of this website hasn't really taken off mainly I guess due to this website being new and having a very niche focus of Amiga Pd / shareware games. There was however an interesting post which recommended a game I had never heard of called Pacomix 2 and I have being meaning to try it for some time. This month seemed the ideal opportunity as the focus is shareware / pd games beginning with the letter P.
Pacomix 2 is a game which challenges your logical thinking. 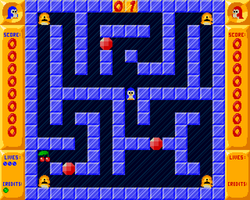 You control a Pacman type of character and need to guide them around the level to collect all the fruit items on the screen. The difficulty is that the character will continuing moving in the direction you have selected until it hits a wall or obsticle. Therefore you have to plan your route carefully to ensure that you successfully collect all the items. There are different items on the levels which can influence the movement of your character. These include bumpers which will redirt the direction of your character or stop signs which unsuprising stop your character to name but two. In conclusion this game is massive and will provide you with hours of play. The game contains 6 worlds which each contain 20 levels giving you 120 levels in total to play. If your puzzling thirst has not been quenched after these then there is a level editor provided so that you can design your own challenging levels. Bignonia was a developer which produced updated many C64 games to the Amiga as shareware games. The games updated included, Aztec Challenge, Bagitman, Donkey Kong, Frantic Freddie, Pharoh's Curse and Zaxxon. All these games were produced to a very hight standard and were very faithful updates of the originals. The graphics were improved but still maintained an 8 bit feel in terms of their animation and large block style rather than attempt to use the full power of the Amiga. This works well and helps to maintain the charm of the games. The game play for Popeye is very basic and involves collecting a certain number of items such as hearts whilst avoiding the baddies that patrol the levels. Once you have collected a certain number of items you complete the level. This type of simple game play is fine for few minutes of distraction but it is unlikely you will return to this game regularly in the future. In conclusion Popeye is perhaps the weakest of all Bignonia's games. If you are looking for a more challenging platform game then Pharoh's Curse might be a better game to try as it follows the 8 bit arcade adventure model and spans many screens and should hold your attention longer than Popeye. The best game out of the collection is probably Zaxxon which is almost a faultless update of Sega's classic arcade shooter. This game is probably my all time favourite public domain / shareware game for the Amiga. It is a game which has had plenty of love and attention showered onto it by the author, Martin Rebas. The game took a the programmer a year to write as he wanted to make the game as user friendly as possible and the finished game consisted of 23000 lines of assembly code to produce a very professional looking game. This long development period was not wasted as every aspect of this game is pretty much perfect and I would struggle to think of any recommendations to improve it. The game has a cutesy intro sequence which is reminiscent of the Japanese platform games such as Rodland of the time. The music for the game is perfect in that it has that annoying but addictive quality that keeps playing on in your head long after you have switched the computer off. The characters are simply but beautifully drawn, there are power ups to obtain and a two player game included. The level maps are nicely designed and prove a stern challenge but you never feel as if you have died for any other reason than your own limitations of a player and always feel you can improve on your last game. This inevitably leads to another game and another game which is the key feature of any great game. The quality of this game puts many commercial releases of this sega classic to shame and is even more impressive when you consider this was the work of one individual rather than a team of specialist programmers, artists and musicians. The author clearly loves this game too and has gone onto to program an update for the PC which can be obtained from his website with the new game called Ai Pengo. It is worth visiting his website as he has a section on his other Amiga games which he has kindly now made available to be downloaded for free. There are some classic games to be found here including Motorala Invaders 2. There is unfortunately some sadness linked to this game. The programmer unfortunately suffers from RSI as a result of his programming and is now limited to how much time he can spend working on computers. This is such a shame as he is clearly a talented individual as the Amiga press of the time recognised with their magazine scores for Pengo which were 88%, 93%, and 4/5. We wish him all the best for the future and hope that he is able to manage the RSI and still be able to enjoy computer programming in the future. The game can be downloaded from our new download page for game titles starting with P.